OTTAWA, Canada—As NAFTA negotiators from the U.S., Canada, and Mexico gathered in Ottawa for a third round of talks, the Communist Party of Canada (CPC) held a press conference at the National Press Gallery on Parliament Hill on Sept. 21, and participated in the tri-lateral “Civil Society Summit” on Sept. 23. 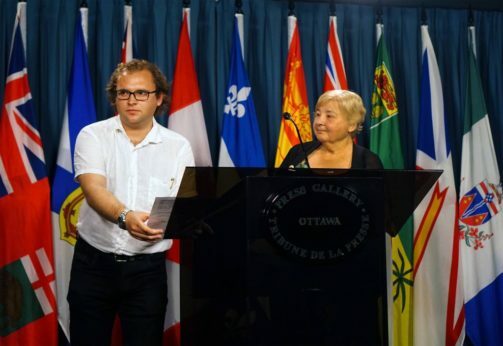 The following day there was a rally and press conference at Parliament Hill organized by the Council of Canadians, Common Frontiers, the Trade Justice Network, Réseau Québécois, and the Canadian Labour Congress (CLC). Organizers read a declaration that was agreed upon by organizations from the three countries. The CPC was part of the rally with a “Get out of NAFTA now” banner. A blimp was brought to the rally by the Council of Canadians and Leadnow which read: “NAFTA hijacks democracy; stop ISDS.” ISDS, or Investor-State Dispute Settlement, provisions are embedded in NAFTA. They give corporations the right to sue governments of another country if it introduces laws or policies that hurt corporate profits, no matter if they benefit environmental, health, or human rights. For example, Lone Pine is suing the Quebec government for $250 million for its ban on fracking. The corporation claims Quebec has violated its “right” to frack. In the afternoon, the “Civil Society Summit” convened two panels for a detailed discussion about the issues surrounding the current re-negotiations. Highlights included the presentation of Indigenous author, lawyer, and academic Pamela Palmater who is Mi’kmaq from the Eel River Bar First Nation. She presented a strong case against NAFTA, the TPP, and CETA, saying that “trade” deals “are a matter of life and death for Indigenous peoples.” She pointed out that increased corporate power, especially in extractive industry, often means brutal violence against Indigenous women and girls in Canada and around the world. Palmater said that the current negotiations, which include limited consultation with the Assembly of First Nations leadership, in no way fulfill Canada’s supposed commitment to free, informed, prior consent of First Nations. The government of Justin Trudeau has said that it would like to see a chapter added to NAFTA that outlines Indigenous rights. However, this rings hollow since the Trudeau government has not said this potential chapter would trump the investment and energy chapters which clearly violate Indigenous rights to sovereignty and self-determination. Panelist Alberto Arroyo from the Mexican Network of Action Against Free Trade stated firmly that “no matter how much we improve NAFTA, it is never going to stop violating human rights. 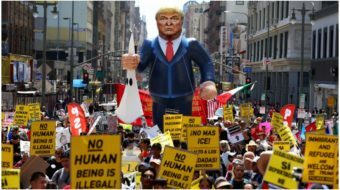 It makes human rights something that can be bought and sold.” That is why the labor and peoples’ movements in Mexico are calling for Mexico’s complete withdrawal from NAFTA. CPC leader Rowley urged unity around a clear message to get out of NAFTA. 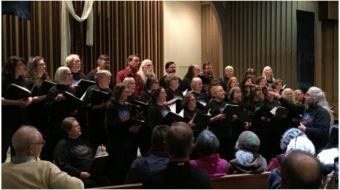 She said that 23 years ago labor and democratic movements were clear in their opposition to NAFTA, but that the current position that much of labor has adopted – including the country’s biggest union federation, the CLC – seems to be that Canada should push for a more labor-friendly version of NAFTA. But this is a serious miscalculation of what NAFTA is, she argued. 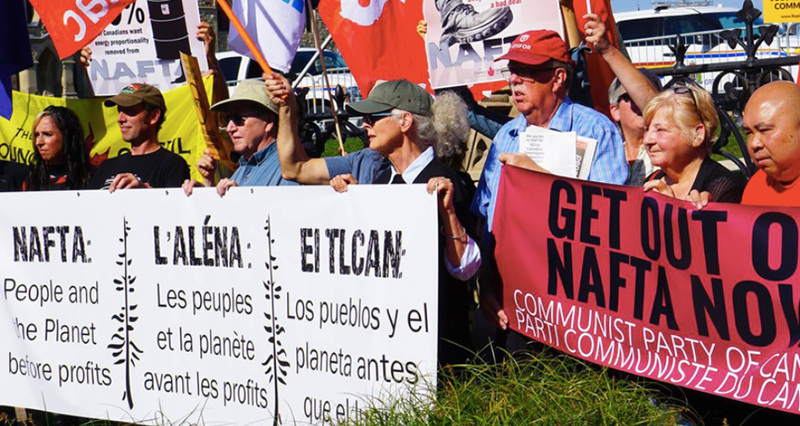 A “progressive NAFTA” is not possible because it has always been a project of multinational corporations and their governments to override the sovereignty of the people of all three countries. The Trudeau government claims it is pushing for a “progressive NAFTA,” with recent statements about wanting to include gender, Indigenous, and labor rights. However, it is certain that this is a smokescreen to hide the real nature of these re-negotiation talks: a further expansion of corporate power. CPC Organizer Drew Garvie linked the rise of the far right with the economic and social conditions created by NAFTA and its built-in austerity policies. “This deal will drive down wages and living standards and open the door further to the ultra-right,” he said. This article originally appeared in People’s Voice and was released by that publication’s Ontario Bureau.